Studying hypokalemia and want to know how to remember hypokalemia and how it is different from hyperkalemia? In this article, I want to give you some super easy ways on how to remember the causes of hypokalemia, signs and symptoms, and the nursing interventions for this condition. I want to highlight the material you will be tested on in lecture class or the NCLEX exam. Most of the body’s potassium is found in the intracellular part of the cell compared to the extracellular which is where sodium is mainly found. Blood tests measure potassium levels via the outside of the cell (extracellular fluid). 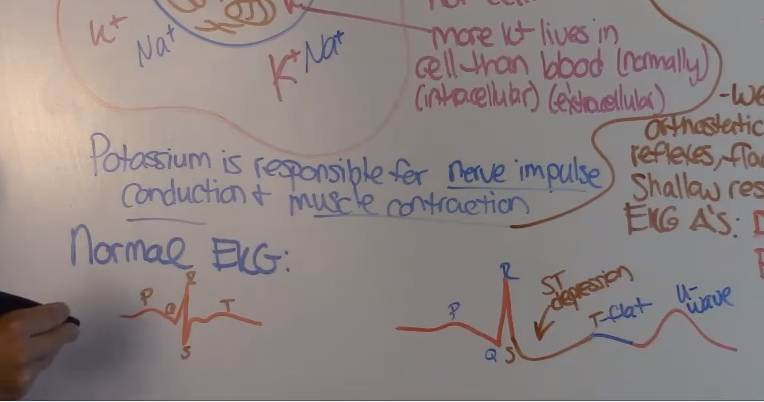 Remember potassium is responsible for nerve impulse conduction and muscle contraction. Try to remember everything is going to be SLOW and LOW. 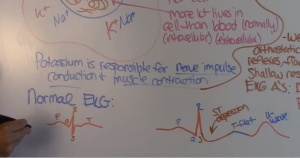 Don’t forget potassium plays a role in muscle and nerve conduction so muscle systems are going to be messed up and effect the heart, GI, renal, and the breathing muscles for the lungs.